"without my glasses, I am by some definitions, legally blind. Whether that is so or not, I certainly can't really function without my specs. As an example, without my glasses, I can see my knuckles clearly from about two inches from my eyes, to about four inches. Then they blur! Without my glasses I certainly could never see a punch or kick coming my way. So, do you have any suggestions for blind old men training? Fighting? Other than the obvious one of avoid confrontations." Answer: I believe that all Krav Maga techniques and training strategies should be designed with all people in mind. That is why, in our style of Krav Maga, we never have "Women's self defense" i.e. there are no techniques only for women or only for short people or, only for people with poor vision. All techniques should be designed for LCD, the Lowest Common Denominator. We don't have techniques for strong people and special techniques for weak people. We have techniques for all people. The technique should work if you are not very strong, and certainly if you are strong. Therefore we train using gross motor moves and never assume we can function with pinpoint accuracy. I will use my forearm instead of my hand (less precision required), I will rotate away rather than try to grab an attacking limb. I will block rather than try and catch their arm or leg. This will serve those with perfect vision and those with less perfect vision equally well. The fellow asking the question writes, "I could never see a punch or kick coming my way." Well, I have news for you, nobody can. As my friend Mark Hatmaker pointed out, with a straight punch headed directly for our nose, we human beings find it almost impossible to pick up on it fast enough to block it or move out of the way. That is why it is dubbed, "The Sucker Punch"; it comes at us in a way that we simply don't see it coming, even if we have perfect vision. For starters, let's not rely upon any technique that requires us seeing it coming. We must train to be able to respond instinctively. The truth is if we have to wait to actually see the attack clearly, it is too late. Therefore we must sense the attack, see the motion and block the knife arm or intercept an attack with a kick to the abdomen. Seeing the attack clearly, sidestepping or doing some other specific technique, is way too slow a process for the real world. We must train to respond instinctively, as Bruce Lee said, "Respond like an echo." Now you may tell me that you have seen some boxers who are able to 'bob and weave' and avoid the punch, so perhaps we should all take up boxing. Actually I did. But let me tell you this; boxing is a ring sport. It is not reality self defense, although in some cases it might be useful. In boxing you are prepared, you know you are about to be hit, you have good lighting, you are in the ring and have room to move around, you are psyched up and ready, and you know what kind of training your opponent has and the kind of punches he will use. None of this holds true for the street. And even so, do boxers avoid most punches or do they get hit a lot? You tell me. Have you ever seen the winner after a fight? There's your answer. Given all the limitations of the street; possible darkness, the element of surprise, not knowing the 'tool's of the opponent; we must train to act blindly, to respond instinctively and not go through the long process of seeing, planning, and then reacting. 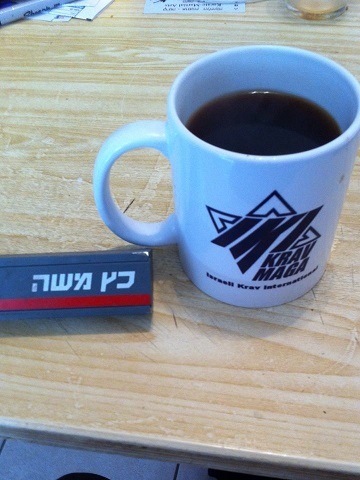 Krav Maga is not a sport, everything is designed for reality. Stay safe everyone.